This year, surprise your guests with a warm welcome of spiced pineapple made fresh from your handcrafted (and easy to make!) table decor. See below for recipes and how to make your own version of holiday hospitality, no matter where you are located. Using a Chestnut Hill Farms Pineapple, cut off the bottom of the pineapple. Use a pineapple coring slicer to easily remove the fruit from the inside of pineapple. 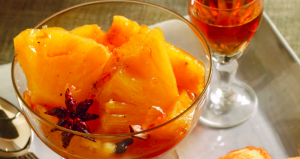 Set the fruit aside for the spiced pineapple (see recipe below). Use a small knife to carve out three oval shapes around the pineapple (two oval across from each other is optional, however three allows the entire table to enjoy the full lantern view). Place onto of the greenery arrangement of your choice. 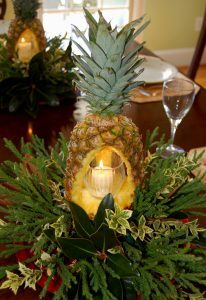 Place a candle inside of a clear glass holder (optional flameless candle) and set inside of your pineapple centerpiece. Invite your guests over and enjoy the beautiful view! Whisk the juice, liquor and jelly, jam, or marmalade together. Don’t worry about fully incorporating the jelly — it will melt in the oven — you just want to break it up. Pour the mixture over the pineapple, toss in the vanilla bean, if you’re using it, and scatter over the spices. Bake the pineapple for about 2 hours, basting and turning it in the syrup every 20 minutes or so, until it is tender enough to be pierced easily with the tip of a knife. The fruit should have absorbed enough of the syrup to seem candied. Allow the pineapple to cool until it is comfortably warm or reaches room temperature. Either strain the syrup and discard the spices to make the dish more elegant, or leave them in if you like the way they look speckled in the sauce; if you’re going to strain the syrup, do it while it’s hot — it’s easier. Original recipe by The Spendid Table. This entry was posted in Featured, Latest News, Recipes, Tips & Tall Tales and tagged christmas, holiday ideas, hospitality, pineapple, pineapple recipe, spiced pineapple, table decor, table setting, thanksgiving. Bookmark the permalink.